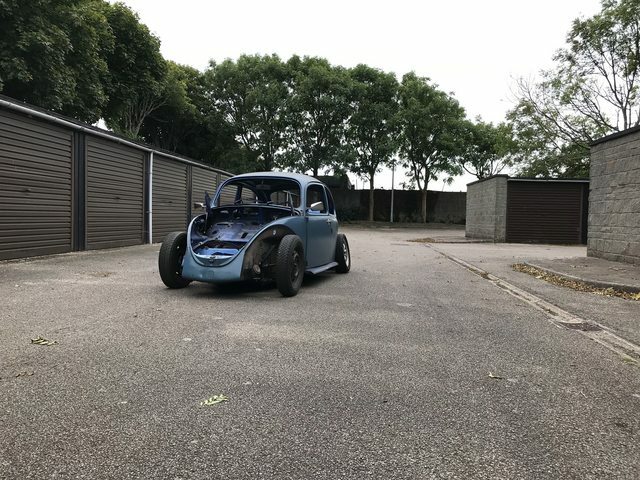 Richie Webb builds a car without Gasburners? Has hell frozen over? I wondered if there would be a host of Porsche bits underneath! It's not Cal Look, but I still really like it! Maybe we'll do one like that at school after the '71 weve just started? My 56 is getting painted! the interior of the body is done. Along with the inside of the fenders, doors, hood, and deck lid. hopefully will be back in my garage in the next few weeks starting to get assembled.
! Maybe we'll do one like that at school after the '71 weve just started? I am not sure using child labour to do all your projects for you is legal? Actually, they're not doing too badly, they've stripped the car down, split the body from the pan and we're getting the pan blasted over half term. They're doing pretty well so far! old beetle with nice wheels....... that's quite the sleeper spec there! i love it! Repaint of my 911 fan unit. Bought a '54 oval from Norway. Was stored since 1977. Factory color is Iceland green put had a respray years back in ceramic green. Put some CB spindles on it and Erco's from a clubmate. Runs nows, replaced brakelines, master cilinder etc. After this season I will do a full resto. Started to polish it. Will get some life back in the paint. Very nice Jesse. That sits perfectly, and the wheel choice is just right too.